Being such an accomplished musician, this guy has gathered plenty of followers over the years! The show was beyond sold-out; there weren’t even enough seats to hold everyone, they were packed in up against the walls! The music also filled the room, squeezing into every available space that was left, and commanded everyone’s attention. Most people seemed transfixed, perhaps in awe that a man of his advanced years was still out there performing and touring, just like kids a third of his age or younger. All admired his skill, watching his fingers nimbly pluck the guitar threads as he comfortably drawled out the blues. Joining him on stage were guitarist Paul Nelson, bassist Scott Spray, and drummer Tommy Curiale. The band rocked out, backing Winter and visibly enjoying the jams. They followed Winter’s lead, taking cues from him, as each song unfolded effortlessly. 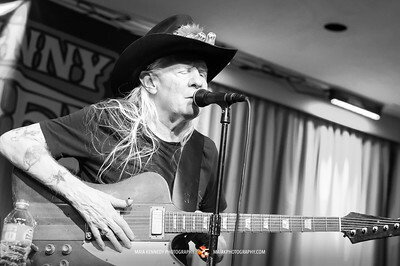 It definitely seemed like a meeting of the Johnny Winter fan club that night; each musician looked to be thrilled just to be there, enjoying the moment. Every one of these musicians is already accomplished in their own right, playing solo as well as with other bands. Nelson, also recognized as one of the music world’s top guitarists, has a long list of credits and titles, including producer, music director, writer, and music arranger. Having worked with Winter for years, Nelson is credited with both writing and performing on Winter’s Grammy nominated album, “I’m a Bluesman,” for which he also wrote the title track. There was a deafening applause at the close of each song and standing ovations for many. The final song brought people to their feet again, clapping and yelling in gratitude for the performance. After the show, many braved the cold in a long line outside the band’s RV to get the chance for a picture and a handshake from the “Guitar Slinger.” Mr. Winter did not disappoint. Although he had just finished a full, almost 2-hour set, he made sure that everyone got their turn. Everyone in the tour group was more than friendly, from the roadies offering to take peoples’ pictures to the other musicians gladly signing autographs too. The night was a memorable one, I feel very fortunate to have been able to be there and photograph the event. I look forward to hearing more of his tunes as True to the Blues has just come out. This is a “career-spanning box-set of rock blues” with 4 CDs and 57 songs (including “Johnny B. Goode,” “Rock and Roll Hoochie Koo,” “Prodigal Son,” and many more, along with two previously unreleased songs).